Gave this to cousin as gag Christmas gift. However it is very soft and picture is exactly what you get. So it was expected. Who needs a cuddle buddy when you can cozy up in bed or on the couch with this huggable boyfriend pillow from Deluxe Comfort? 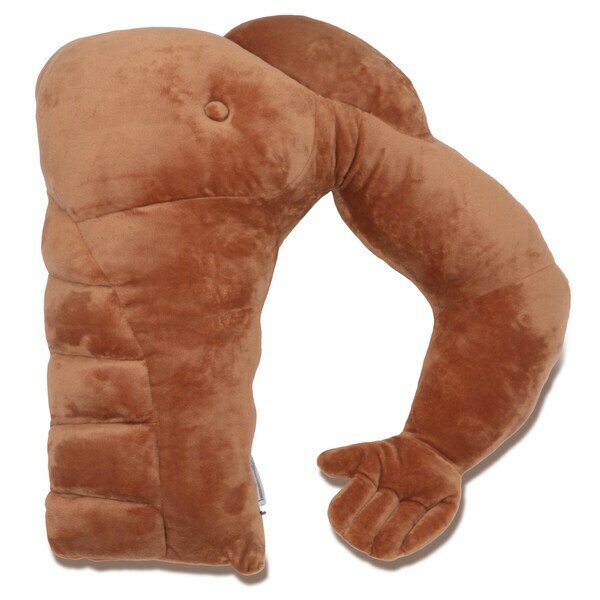 With a beefy arm that wraps around you lovingly, an impressive chest and abdominal physique, and a clean-smelling polyester construction, this pillow provides all the benefits of snuggling a muscular dude without any of the unpleasant odors. The pillow is filled with medium-firm fiber for supportive and plush comfort. I love this pillow, it's so soft, and the arm fits around my neck perfect. Just enough stuffing makes it so comfy, the size is also perfect too. I bought this as a silly birthday present for a friend and everyone LOVED it! They were fighting over who got to cuddle with the "boyfriend" It's soft, and plush so even though I bought it as a gag gift it is practical to snuggle into. I bought this and threw it in the rec room. It is funny to see who ends up snuggling with it! Soft, perfect snuggle size. This was bought as a gag gift for my best friend. She thought it was hilarious. It needs a little breaking in but other than that a fun gift. i bought this for my sister-in-law for christmas and she loved it. great gag gift and even though it was mainly meant to be funny, she still uses it all the time! I’m excited to see how my niece reacts to her gift. It’s the best gift ever. Joke for my single cousin who desperately seeking a boyfriend lol..so Merry Christmas I got her one.